Blyth Spartans have struck an unlikely new sponsorship arrangement. 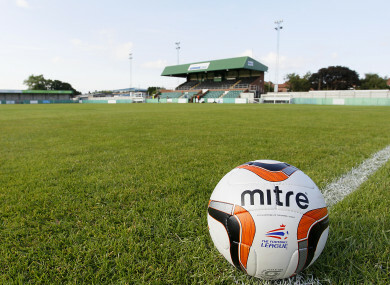 A view of the pitch at Croft Park where Blyth Spartans play. A NON-LEAGUE club in the sixth tier of English football has struck an unlikely new sponsorship deal with a company that offers tours to North Korea, one of the world’s most isolated countries. Blyth Spartans, a club based in the northeast of England, displayed an advertising board during Wednesday’s fixture promoting Visit North Korea, which offers travel packages to the impoverished communist state. Images of the banner quickly began to circulate on social media, prompting both the company and club to confirm the partnership was indeed genuine. “Visit North Korea is pleased to announce a sponsorship deal with English football club Blyth Spartans F.C.,” it said in a statement on its website. Spartans also ran an announcement about the deal in the club’s match programme. Email “Visit North Korea? English football club strikes bizarre deal”. Feedback on “Visit North Korea? English football club strikes bizarre deal”.